What comes to mind when you hear the phrase ‘bedroom furniture’? You’re probably thinking of a bed, and maybe some side tables. Bedroom Furniture Sydney is generally considered from a functional aspect, so you’re more likely to focus on a comfortable mattress and sizeable drawers than anything else. However, selecting the right furnishings can turn your bedroom from a dull, drab, sleeping spot to a cosy room you want to be in all day. There are lots of ways to pick your bedroom décor. The size of the room matters of course, but beyond that, you could select a theme, or you could simply walk around a warehouse, leaf through a magazine, or browse website catalogues and zoom into anything that catches your eye. 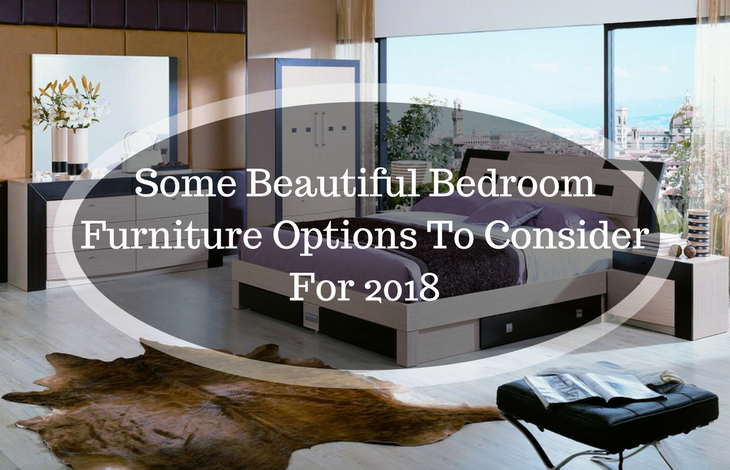 Here are some our favourite bedroom options for 2018. If you have a tight space, you may opt for a palette bed, but a more stylish option is a Zinus deluxe wood platform bed. It has no footboard or headboard, so it can fit flush into a studio nook. It has wooden slats to support a mattress, whether or not the mattress has springs. The frame of the bed is made from solid wood. It’s a relatively low bed, 12 inches in total with just 6 inches beneath the bed itself. The bed has a five-year warranty and is less than $200 so it’s a good deal. Just be sure to regularly vacuum, since you can’t store anything down there except dust bunnies. You might also want to forego carpeting … you’ll be close to the ground and trapped dirt may trigger allergies. Black and white doesn’t seem like a typical styling choice for a bedroom. In fact, it feels like it would be rather dull and dreary. It doesn’t have to be though. You can combine these extreme shades for a dramatic, highly embellished gothic touch. Start with the Canova, a glossy white bed imported from Italy. It has an ample headboard with chrome accents, and can be accessorised with a matching bedside table and dresser. It’s relatively easy to find gleaming white accessories like vases, decorative plates and mirrors. Offset the white with an elaborate matte black chandelier and black throw pillows, as well as black silk sheets beneath an ivory duvet. You can fill the walls with black-and-white paintings, etchings, shadow art, or family portraits. For the floor, a black rug would work better than black carpets (which can be overwhelming) or white ones that are impossible to keep clean. You can also use subtle chrome or stainless steel trinkets, like a candlestick holder or jewellery tray. A bed with a little padding is great way to add warmth and cosiness to your room. The Woodside upholstered panel bed from Three Posts is a good choice. Both the headboard and the bed frame are upholstered in neutral linen that works well with any kind of décor. The headboard has buttons and tufts for added appeal, and an upholstered footstool can be a good complimentary piece. The bed takes about half an hour to assemble, and you can clean it with a damp cloth and some home dry-cleaning solution. It works best with a box spring mattress, but you could also buy an adjustable base. Traditional bedroom fashion is fussy and ornate, but if you want to go contemporary, try the Zinus Studio Metal Bed. It works well for small bedrooms, because it seems to shrink into itself, making the room seem larger. Yet it’s not an unpleasant shrinkage. Instead, it has a clean, minimalist appeal. It costs less than $100 and is available in twin size. If the bed itself is too simple and you want something a little fussy, you can use colourful sheets and an elaborate duvet or cushions, with deep-pile bedside rugs. The bed has a foot of floor clearance, and your mattress will be supported on ten wooden panels. It’s sturdier than it looks, easy to put together, and it has storage space under the bed. However, putting anything down there will deter from your bed’s minimalist appeal so best to leave it bare.